MGCCT is a Singapore real estate investment trust (“REIT”) established with the investment mandate of principally investing, directly or indirectly, in a diversified portfolio of income-producing real estate in the Greater China region, which is used primarily for commercial purposes (including real estate used predominantly for retail and/or offices), as well as real estate-related assets. MGCCT is the first commercial REIT with properties in both China and Hong Kong, and its portfolio comprises Festival Walk, a landmark territorial retail mall with an office component located in Hong Kong, Gateway Plaza, a premier Grade-A office building with a podium area in Beijing, and Sandhill Plaza, a premium quality business park development situated in Shanghai. The three properties cover a lettable area of approximately 2.6 million square feet, with a total book value of S$6.0 billion as of 31 December 2017. MGCCT’s investment mandate includes markets in Hong Kong, first tier cities in China (Beijing, Shanghai, Guangzhou and Shenzhen) and key second tier cities in China (Chengdu, Chongqing, Foshan, Hangzhou, Nanjing, Suzhou, Tianjin, Wuhan and Xi’an). 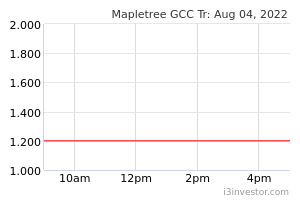 MGCCT is managed by Mapletree Greater China Commercial Trust Management Ltd., a wholly owned subsidiary of Mapletree Investments Pte Ltd. For more information, please visit www.mapletreegreaterchinacommercialtrust.com.